It is not a bad thing to grow up believing that moderation in all things is an honorable goal. Extreme positions and behaviours seldom help whatever the cause. “Going over the top” – originally a phrase that had great meaning during World War I and more recently fashionably abbreviated to OTT – is thought to not be a good thing. So the recent display of binge grieving over the awful death of Peter Hughes, the Australian cricketer, leaves us in something of a confusing position. The grief felt by those outside his circle of family, friends and accomplices is to some degree inexplicable. It is Princess Diana all over again. Sometimes there are people whose contribution to the world has been such that a widespread display of grief is both appropriate and understandable. 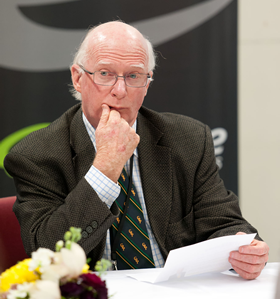 Mickey Joseph Savage and Norman Kirk, are two New Zealand leaders whose contributions had captured the affection of significant sections of our population and more so than at the times of their respective deaths. But for an Australian cricketer whose test career has been relatively short – this was no Don Bradman – the extent to which the tragic death has been the central focus of media and pretty well all parts of the community has been astounding. It is, of course, largely fuelled by the social media that got cracking with a #putdownyourbat campaign which, had it been restricted to appropriate expressions, might have been OK but to see a soccer game start with a bat and silence reduces it all to sheer theatre if not farce. The displays of uncontrolled emotion shown on television by those who ostensibly lead, such as the captain of the Australian cricket team invites me to ask: Are these the great great-grandchildren of the men who went to World War I, the grandchildren of those who went through the Great Depression and the Second World War and the sons of those who now lead our countries in many different ways? Restraint and dignity takes courage and fortitude and we need such characteristics more than ever. The theatrical reaction to Hughes’ death robs the community generally of the dignity of paying respect appropriately and in a more muted fashion. About seventy death notices appear in each and every edition of the NZ Herald and each reflects a loss to a family and the circle around them. They bear this with dignity and privacy. They are greatly to be admired and one hopes that the examples such as this will stand the younger ones in good stead. I was in the US last week when the announcement that the Grand Jury in Fergusson MS would not prefer charges of murder against a policemen who had shot dead an African American youth led to widespread rioting across a dozen cities. This was binge protest at its worst. A mix of every grievance, of pent-up disputation, and of sheer hooliganism that ended up masking completely the point of the protest – police violence against the black community. IT seems to be a fashion that OTT is now OK and the media of course simply cannot help but feast on it – they are addicted to such behavior. Look at the number of deaths that have occurred in New Zealand recently as a result of fights that have got out of hand. When they start there are no voices of reason that calm it down, it seems that everyone wants to join in and usually with dire consequences. Some responses to the Hughes accident are obvious and cricket as a sport could react more sensibly than it has. The Saturday after the tragic event I went for a walk and passed a number of parks in which 8-10 year olds were playing cricket with a standard hard cricket ball and batters were decked out in all the protective equipment imaginable. Many of them were simply too small in stature to move adequately with all this gear. They would have been better playing with a softer composite ball and learning to protect themselves through movement. No-one sets out to maim or kill in the interests of sport but key objectives in cricket are for bowlers to intimidate batsman through both pace and placement of the ball. With 100 instances of the kind of injury that Hughes suffered known to world medical science, and with a total of now 12 deaths in cricket, perspective is very important. Within days of Hughes passing away, an Israeli cricket umpire was struck with a cricket ball on the head and died. Little mention of that. Balance is also important. We have a role in education to develop the judgment and balance that equips young people to cope rather than simply copy.